In the second of what has become a three part look at the capital’s top sides I shall be looking at Arsenal. The Gunners are a side who have slowly deteriorated from being one of the most feared and respected sides in the world to a team of nearly men. I don’t want Arsenal fans to think I am disrespecting either themselves or their manager because I do have the utmost respect for the club and Arsene Wenger. My gripe, like so many others I guess, is that the club could easily be challenging for titles regularly but it is held back by the men in power. I believe that Higuain could be the difference for Arsenal next season. That though seems to be changing this summer and the first real statement of intent looks set to be made with the signing of Gonzalo Higuaín from Real Madrid for a fee rumoured to be around £23 million. This is a bold move and a real shift of transfer policy from Arsenal. Clearly their established transfer policy has been to sign relatively unknown youngsters and to allow Wenger to develop them. Yes I am well aware that Arsenal have signed a number of established players in recent years but none of them (bar perhaps Santi Cazorla) have been in the same league as Higuaín. This is a forward who has years and years of experience with one of the biggest clubs in the world and he is still just 25. Believe me as a Chelsea fan I am properly jealous of this signing as I would have loved to see someone like Higuaín at our club. Who else should follow? Well in my opinion Arsenal could do with getting in a quality goalkeeper to challenge Szczesny because in my opinion keepers need competition. It worked with David De Gea at Manchester United and Hugo Lloris at Tottenham, even Petr Cech knows he has Thibaut Courtois waiting patiently to take his place. At Manchester City I believe part of Joe Hart’s dip in form can be put down to a bit of complacency over his place in the team and I believe Szczesny might feel the same way. If Arsenal could get a good goalkeeper in, maybe someone like Rene Adler then perhaps he might start to perform better. At the back I’m not convinced by Sagna anymore but I think Jenkinson is a very good prospect so it might be worth playing Jenkinson more this year and gradually easing Sagna out. I’d also like to see one more centre-back because I’m not sure Vermaelen is the same player he was a couple of seasons ago. He doesn’t look as commanding and this partnership between Koscielny and Mertesacker really seems to have thrown him. Who to sign is a little trickier, I mean Stephane Mbia has been linked to Arsenal for some time but is he really up to it? As a back-up perhaps but the player I’d love to have seen Arsenal sign was Aurélien Chedjou who joined Galatasaray from Lille about a month ago. He is a terrific defender and he wouldn’t have been too expensive (I think Gala paid about €6 million) but I’d like to think that Wenger knows who his targets are. Could Wilshere and Ramsey work together in the centre of midfield? The Arsenal midfield is where things start to get a bit complicated. I reckon I could do a whole article on just the midfield but I’ll try and concise it as much as I can. Clearly Wenger has a preferred 4-3-3 formation and this season that has involved Mikel Arteta often sitting deep. Personally I feel this is a waste of the Spaniard’s talents but I understand he is best placed to fill this role. I believe that Cazorla should be one of the three as an offensive player (almost playing in the number 10 role) and he is wasted on the left for me. That leaves two spots in the middle three and in my opinion there are two options. Either Arsenal sign a really combative midfielder, someone like Lars Bender maybe (who I know Arsenal have had a bid for rejected) and then they can release either Wilshere, Ramsey or Arteta. Or they don’t sign a big name and try and work out how to play Wilshere and Ramsey together. The latter option is something I feel they should exploit in games against the smaller teams with Ramsey and Wilshere acting as box-to-box midfielders. It may leave the defence a little exposed at times but I would back these two players’ intelligence. In the bigger games I’d be tempted to use a midfielder who would sit deep and break up attacks but Arsenal lost or drew too many winnable games last year. That is one area I believe they really need to improve on if they are to catch Chelsea and the two Manchester sides. Moving slightly further forward and we encounter the attacking midfielders/wingers. In my eyes Arsenal should play two wingers against harder teams and then throw in an attacking midfielder against weaker sides, probably Cazorla. I still think that a genuine left winger is needed but the fact that the last time Lukas Podolski completed a full 90 minutes in the league was the 2-2 draw against Liverpool in January baffles me. I think “Pod” offers a lot to the side and he had a pretty solid first season in England with 15 goals and ten assists overall. I’d like to see him used more often and I still believe that Rosicky still has something to offer to the side. Clement Grenier? I’ve seen him on plenty of occasions this season and whilst he isn’t a world class transfer all the ability is there and if anyone could nurture him I’d back Wenger to do it. He could happily play in the centre of midfield or in the hole. I think that Arsenal should persist with Theo Walcott down the right flank; I don’t think I would ever feel comfortable with him playing down the middle. Yes he has shone there occasionally but Arsenal’s relentless pursuit of Higuaín just shows that they don’t trust Walcott there. Now to Gervinho, where do I start? I’m sorry to any Arsenal fans that believe Gervinho has anything to offer to the side but he is just a waste of space in the squad. He hasn’t cut it since his step up from Lille and if I were in charge I would have been pushing very hard to return him to his former club with some cash in exchange for Dimitri Payet. In terms of league football only Iniesta, Ribery, Hamsik and Ozil contributed more assists that Payet across Europe’s top five leagues last season, that is esteemed company there. Unfortunately for Arsenal Payet completed his move to Marseille a few days ago and in my opinion it was foolish if they passed up the opportunity to sign him. Clearly up front the main man will be Higuaín with Giroud playing a far less important role. Is that fair? Probably not given that on the face of it Giroud’s first season wasn’t that bad but he did go missing in games sometimes and he missed too many chances that someone like Higuaín would have scored. Chamakh has to go and so does Park (I might be wrong but I’m fairly certain Park is yet to start a game for Arsenal) whilst Bendtner looks like he’s pretty much gone. As for Alex Oxlade-Chamberlain I’m not entirely sure where his best position is. Clearly he is a very good winger but I’d love to see him get a long run in the side either in the hole or playing in central midfield, I believe he could be very good there. Alas that will probably never happen but I’d hate to see the Ox become nothing more than a rotation player. I reckon he could be a key man for Arsenal in the future and he is a totally different player to Walcott and that should mean he is considered for selection in big games too. 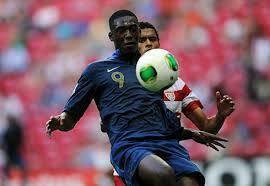 Will Sanogo feature next season for Arsenal? I don’t profess to have seen enough of Arsenal’s youngsters to know if any of them are ready for the first team but you would imagine new boy Yaya Sanogo would be hovering around the first team squad. I thought Miyaichi impressed at Wigan before his injuries and he might be given a go. I’ve heard good things from Arsenal fans about Gnabry and Eisfeld and I seem to remember watching a youth match between Arsenal and Chelsea where Chuba Akpom looked very good. Arsenal have always been good at bringing through their youngsters and I’m sure Wenger will know when the time is right. Honestly right now do I think Arsenal can overtake Chelsea and mount a serious challenge to the Premier League title? Probably not but that is primarily because the squad is weak in some areas and because they need to be so much more consistent. The three sides that finished above Arsenal last season all have new managers and that should not be discounted because stability is a wonderful thing in football. I think this will be the tightest title race for ages and any of last season’s top five could end up at the top and a lot of it will depend on the new managers. If Wenger and Arsenal just do what they do well and iron out the mistakes I wouldn’t bet against them finally breaking that trophy drought next season.